Is this normal during a storm and only in a 15 minute period? This was between a time frame of 15 to 20 minutes where these numbers came in during a thunderstorm. This can't be normal, right? Re: Is this normal during a storm and only in a 15 minute period? Check your outside wiring, especially any fittings/connectors. Does anything look badly aged & damaged? When it cuts into the highest frequencies only like that, and exponentially so, that's usually the skin-effect (in AC circuits) demonstrating some surface corrosion of the center conductor. So please keep an eye on it. It's also possible maintenance was working on the lines in the storm somewhere upstream of your tap, and that's what you're seeing logged here. But it shouldn't be the kind of thing that keeps happening everytime it rains & storms. Thus, it'd be worth it for the long term to check for a cable signal leak. Ingress leaks (stuff from outside leaking in) can be checked with a meter that in-house tech use on pretty much every job, egress leaks (our signal leaking out) can be picked up with a specially-calibrated digital-antenna-based detection meter. Neither is good for the long term. Places to check: tap, groundblock, spliitters/amp/demarcation, and behind the outlet wallplate (if applicable, sometimes there's no outlet and it's just a wire right through the wall or floor). If you can't spot it, and if this continues, then please schedule an appointment so we can have a trained employee take a closer look. 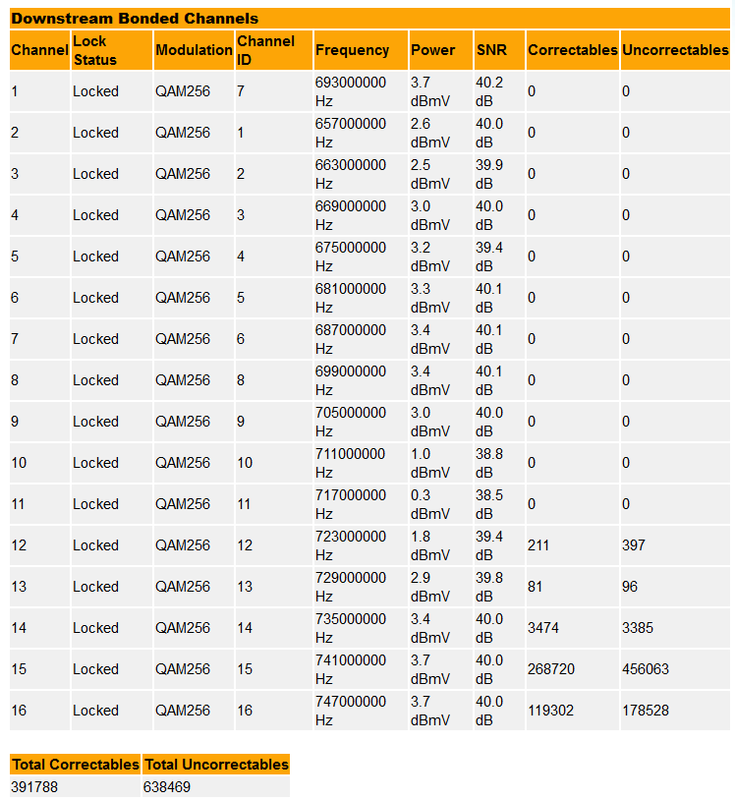 Not much difference in delivered DS signal level, but a huge number of uncorrectable errors. I'd be looking for a connector that pulled loose, allowing a lot of signal ingress at 741 and 747 MHz, which are cellphone channels in the FCC's world. It would be appropriate for Spectrum to conduct a drive test in your home's immediate area using their system leakage detector. Start first near any places where tree branches came down in the high winds. YOU need to point them in the right direction. This is ingress from 4G LTE cell sites and probably broken hardline on the street or your "drop" from the pole tap. Very common in high winds especially if there's tree branches chaffing the line. It's not "NORMAL" and will only get worst.